I spent the weekend at two different places, one in my backyard and the other atop a hill. It was not only pleasant - for me and the butterflies - but damn scenic too. Although we bagged few sightings, but those we sighted were pretty much uncommon! New species of flowers are blooming, and as the monsoon's reign comes to an end, the life seems to bloom at its pinnacle. Without wasting anytime, I'll go through the macro world of wonder that I came across. The Butterflies, especially the big ones always amuzed me. But considering they do not pose for me well, I always envy them. One such is the Blue Mormon. We saw it very commonly flying high in the canopy... coming down on us only to fly back up again! It is one hell of a butterfly that never wants to sit! 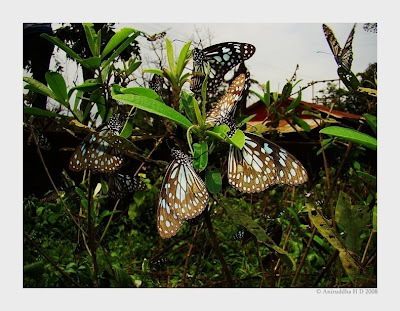 On the other hand though, we saw many, many danaines puddling on specific plants for the alkaloids. All those who do that are males, who come here in search of alkaloids that help 'em in sperm production* needs recitation. As soon as I backed off, they all flew off in the air... and it was like bliss amidst 'em! My luck with the Swallowtails or the Blues is not going good. 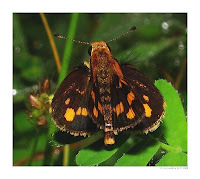 But the Brushfooted are being nice with me, and it seems the Skippers are impressed. On a serious note, I've been hunting specifically for Skippers only and have been pretty much lucky. On saturday I found one "Common Small Flat" - a Pyrginae. 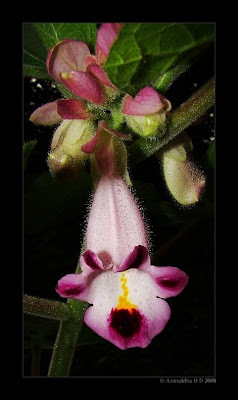 It is common yet not abundant - as stated by Wikipedia - and found exclusively in post-monsoon months. No wonder I saw it now. 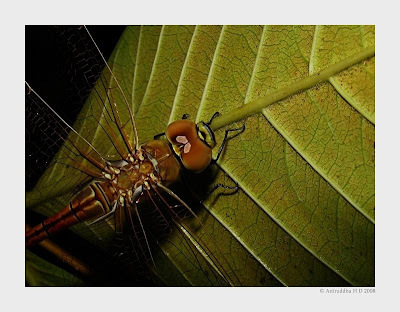 It occurs on open patches, prefers sitting under the leaf but sits over the leaf while basking. The real story goes, I was at the garden stalking a Blue Mormon, and when I thought that it sat - or vanished - in the bushes, I dashed downhill, and instead of that, I saw this tiny cuteness! On the next day, we saw a Rice Swift - again. While walking on a grassland, we came across a tiny thing that flew at our approach. We later got the privilege to come close to it and photograph it. 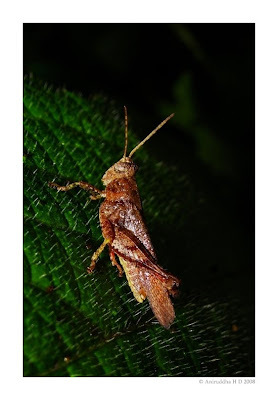 We were not sure of it's identification but thought it might be a Bush Hopper or a Tamil Grass Dart. 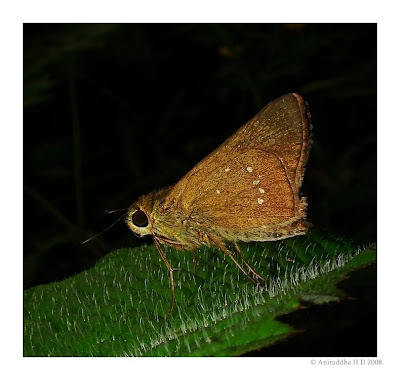 It's found to be a Tamil Grass Dart indeed. 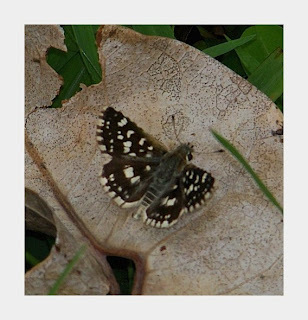 I was lucky enough to have captured a Common Spotted Flat. 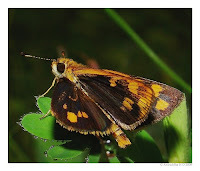 Although 'common' is it's first name, it is not as common as it's cousin Malabar Spotted Flat. 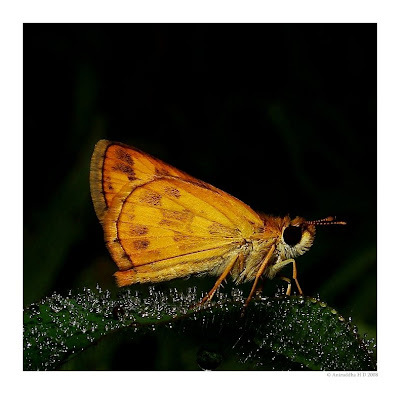 While walking alone the fence that separated the farm from the grassland, we stumbled onto a tiny skipper - the Indian Skipper. Cutest of all! Unfortunately, he was charged up and did not pose for us at all. He got away into bushes while we stalked him. I managed a horrible record shot though. That's all for the weekend bash the Skippers arranged for us, and I'm thankful of them cuties! 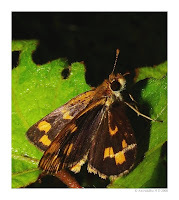 Skippers - the Hesperiides are interesting butterflies. 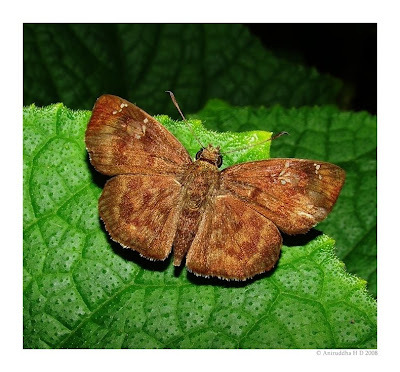 With the theory that says they're the direct descendents from the moth to a butterfly, they are but very well evolved too. And that's not it on a personal front. They're also mysterious, quiet difficult to identify and entertaining to find. When on the field, I try and capture everything that's possible for my camera. 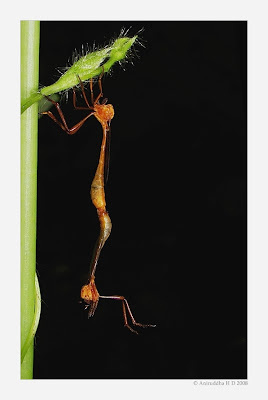 So other than these scaly winged beauties, I photographed this tiny grasshopper drenched in morning dew. Too bad, for there exists no common name to him. And a scientific name that exists, is only known to a mere group of people. We also came across mating Dipterans (picture below). These flies looked like Robber-flies, although I'm not sure. 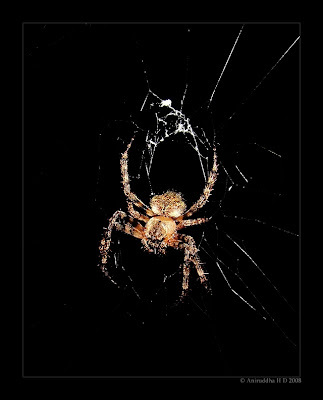 Them Spiders awaited near their web, on their web awaiting a prey. And we enthusiasts came to document them. 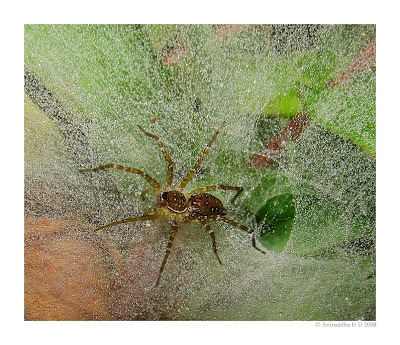 One such is is Tunnel-web Spider/ Grass spider (Agelenidae) - similar to a Wolf Spider. They were omnipresent on thin grass, their webs full of dew. 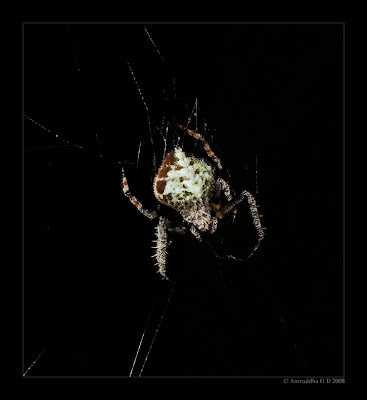 The Orb-weavers (Araneidae) - other than Giant Wood Spider, were omnipresent too. Their numbers increase as monsoon comes to its end. And as winter gains strength, they again dwindle in their numbers, so this is the best time to find 'em in their peak numbers and adult sizes. We also came across a lone spider which is yet to be identified, however I think it is a Ground Spider. But it was sitting high on a plant. That was all, four new species of Spiders ain't bad at all. 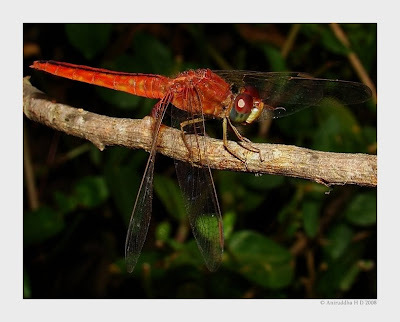 My recent love for dragonflies was also fullfilled on this weekend session. 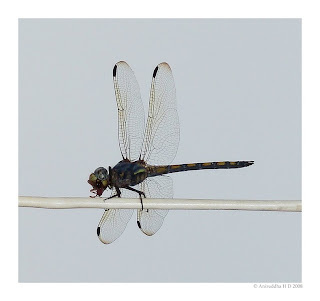 With a lot of unidentified dragonflies, I also saw the commons. 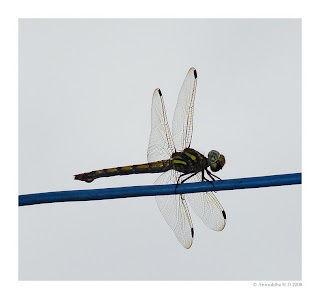 Two dragonflies yet to be IDed perched high up on wires are both Potamarcha congener. 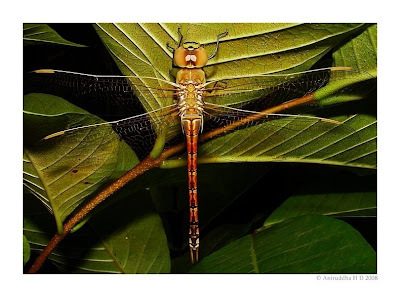 And below is a Darner that is yet to be IDed too - called Hemianax ephippiger. We also saw a pair of Ground Skimmers mating, but couldn't capture it thro' lens. However I captured the female Ground Skimmer. 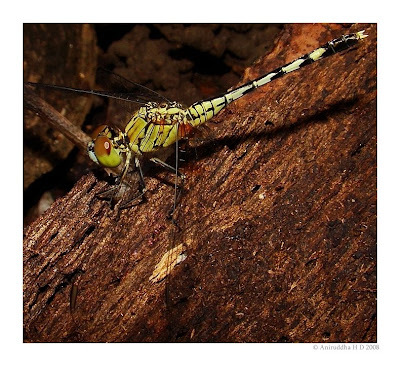 The female - as seen below - is yellowish in colour while the male is bluish. ...and a Ruddy Marsh Skimmer, male. 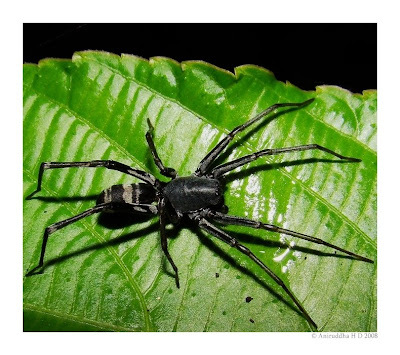 Identified by its dark orange colour, and a black stirpe that runs dorsally through its abdomen. 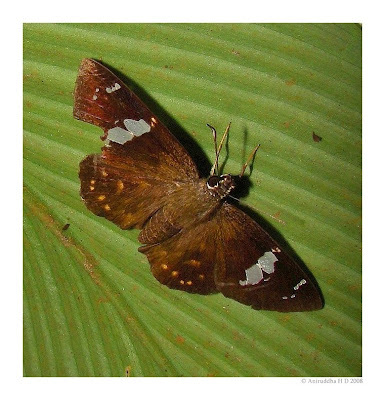 The female, whereas, is on a yellowish side, with the typical dorsal black stripe that runs through the abdomen. I was fortunate to have the opportunity to click the Black Stream Glider again. I had clicked it previously too, with really bad results. 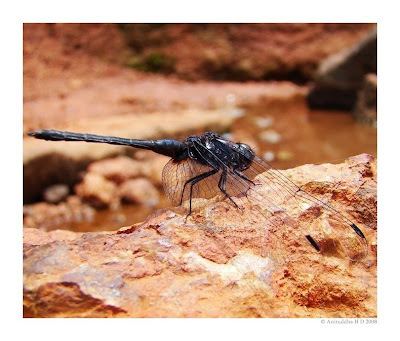 It's a dragonfly exclusively found along streams, with its dark deep blue colour, it always amuzes me. Lastly, I re-captured a Granite Ghost - up close. 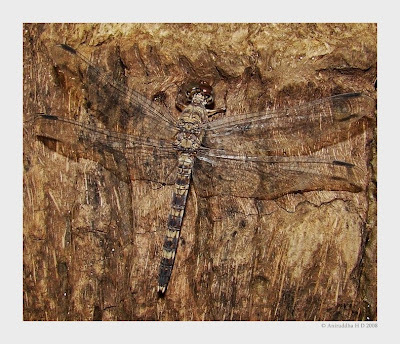 It's one suberbly camouflaged dragonfly that loves sitting on stones or anything that stands verticle. This one was sitting on a Palm. Here ends the trail. 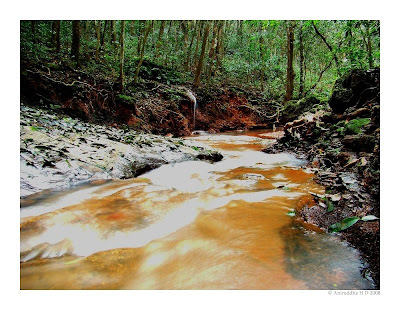 We had fun, super-dooper fun, and also cherished what all nature has created - that always go unnoticed.